I got the fever, FEVER!!!! 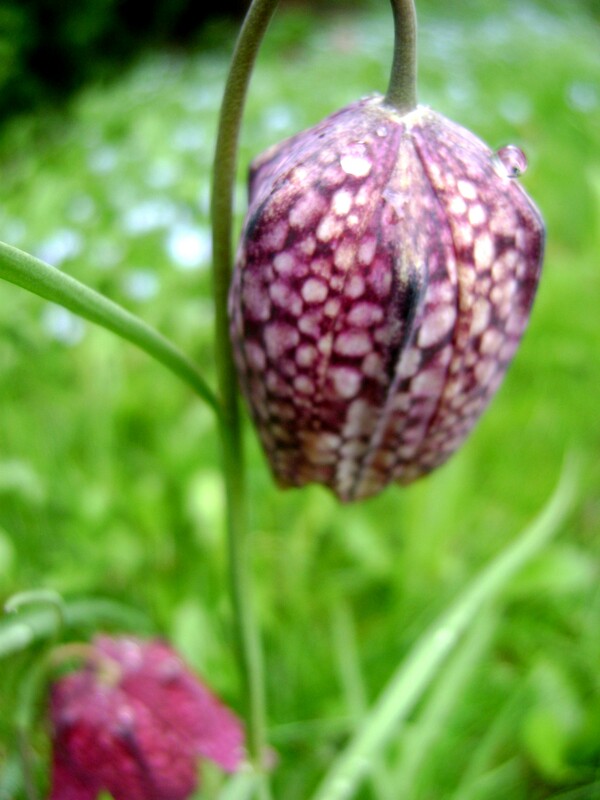 Fritillaria fever that is. I feel like I must have a huge drift of them, a lovely meadow, like the one in Hyde Park that I would walk by, every day on my way to work. I know that you have heard this before, my obsession with drifts of bulbs. Snowdrops, crocus, Scilla, it never ends, but luckily, (or unluckily enough for Ian’s wallet), I have the room. I can have a drift of bulbs, (one variety only at a time for more visual impact), in every corner of my garden. 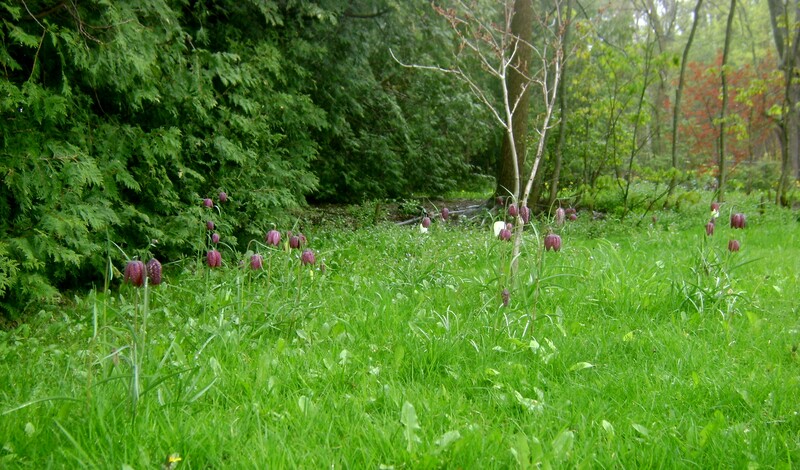 Here is the start of the Fritillaria meadow. May it only get larger! I know it was my idea, although Gail had a lot to do with it. 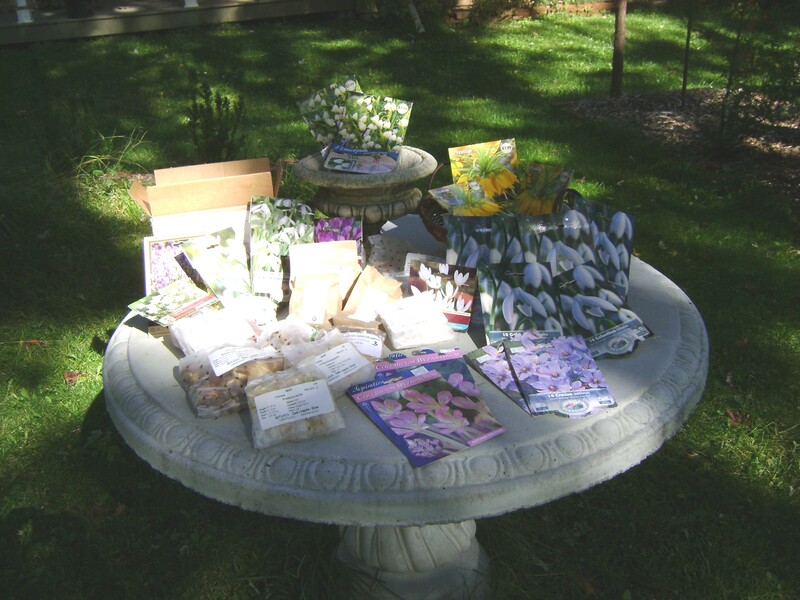 But who would guess that 1,000 crocus bulbs would take soooo long to plant. I did think that I would get a bit more help from Ian, but (unfortunately) he found his own project to work on, and I was on my own. 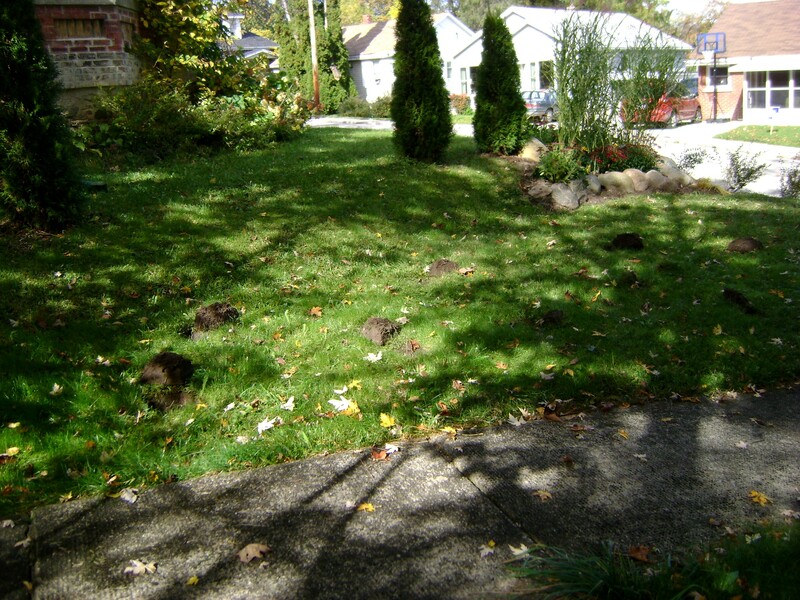 (OK, not quite on my own, he did dig a couple of holes for me, maybe 80, before he bailed). 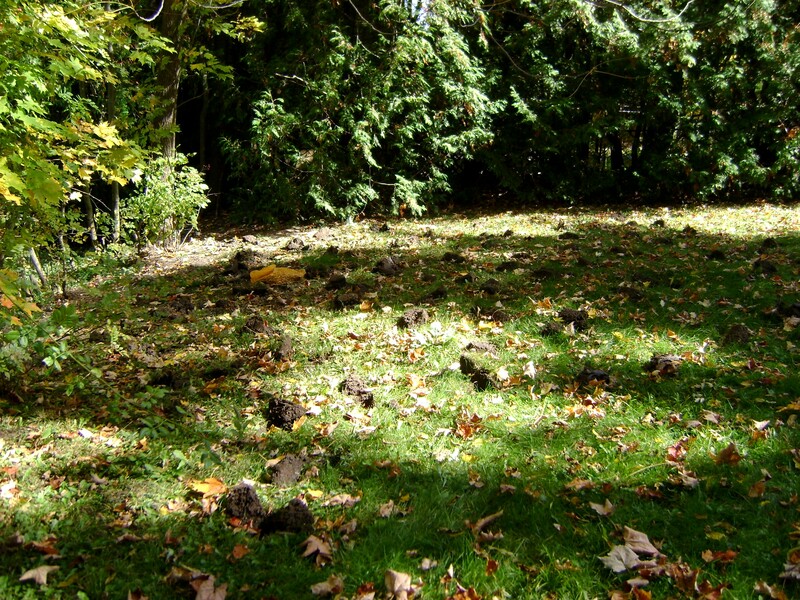 Lets see, 1,000 crocus tommasinianus bulbs divided by 80 holes = 12.5 per hole, I can handle that. 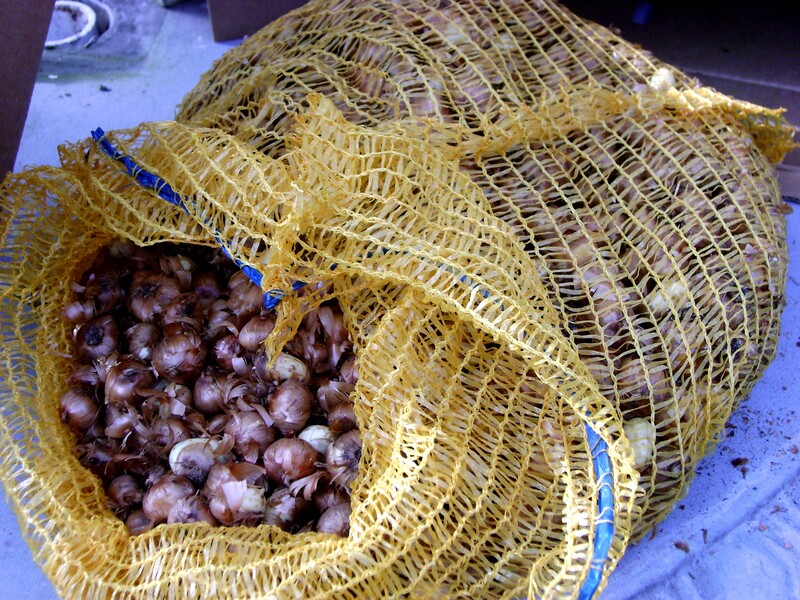 But I have 150 fritillaria meleagris bulbs to plant. At 10 per hole, that was only another 15 holes, I can handle that. Wait, I forgot the 50 allium christophii bulbs, I can handle that! Hmmm, it looks a lot more close-up! OK, due to circumstances beyond my control (Ian), I would not be back to Kilbourne Grove till Hallowe’en, so I wanted to get the bulbs in. I had already planted all the other ones, I was a woman on a mission! 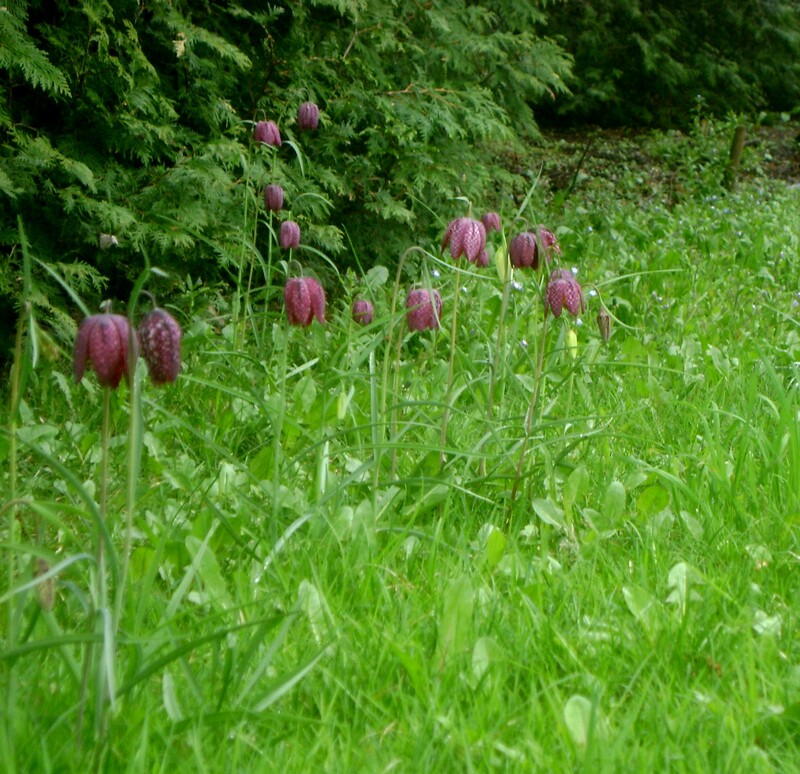 The fritillaria are going in the front, on each side of the front sidewalk in the grass. (I saw that at Kensington Gardens in London and loved the way it looked). That is only 7 holes per side, oh no, I did not order enough fritillaria! It is going to look sparse, oh well, hopefully they will self seed, and there is always next year, lol. 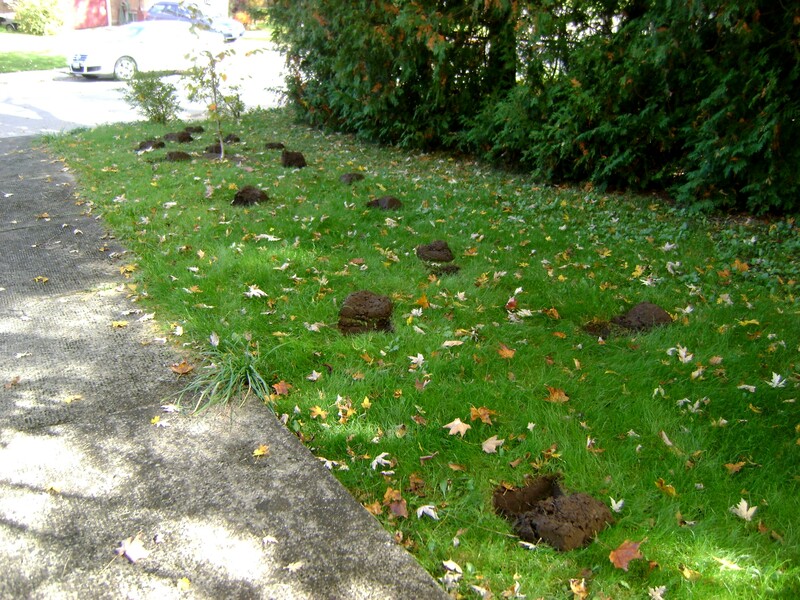 Fritillaria bulbs are a nice size to pick up, drop them in the hole, put the chunk of sod back and firm down, there that didn’t take too long. This looks a lot better. The holes are much closer together, hopefully I will get a nice show. Ooooh, fiddly bulbs, why are they so tiny….slooow going! Done!!!!! The allium were a piece of cake in comparision, 10 holes in the Lime Walk, 5 per side, 5 bulbs in, and finished. Come visit me next spring for the grand unveil, see you then! Every year is strikes me. I always think that I will remain strong and resist the urge. What am I talking about? Just the urge to keep my bulb order to reasonable standards. This was the scene Wednesday at Kilbourne Grove. 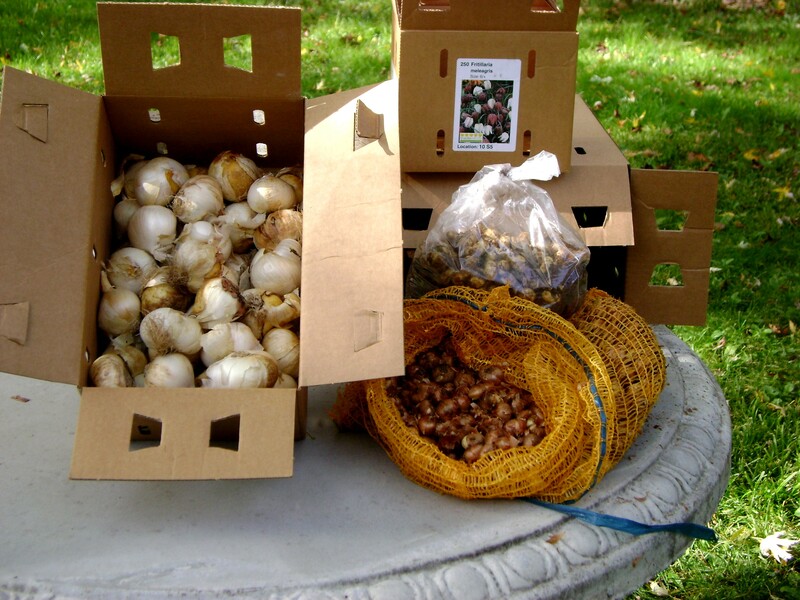 A gorgeous sunny day, and a sprinkling of bulbs to plant. Yes, I said a sprinkling. Don’t think that the 252 I planted was the majority of my order. No siree, the balance still has to arrive, that includes my 1,000 crocus tommasinianus, 150 fritillaria meleagris (inspired by Barry Parker), and my Veseys order. That is for 105. 2010 =1,507 bulbs. Yay, highest score ever!!!! (of course, that could still increase, the bulbs will be going on sale at the big box stores soon, and I have been known to pick up one or two on impulse! Want to read how many I planted in 2009, you can here.